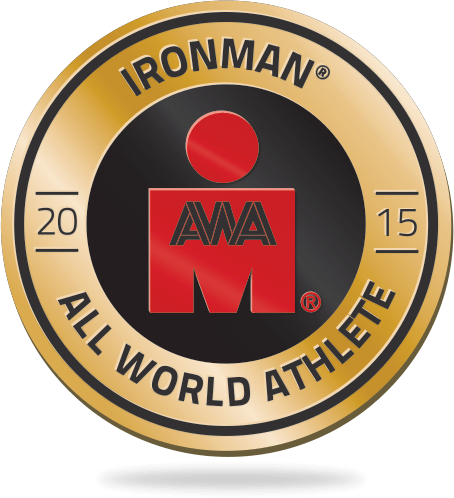 Epic 5: If One Ironman is Good, Five in a Row is Awesome, Right? Looks simple until you realize that the athlete is going to take anywhere from 12 to 17 or more hours to complete each day. 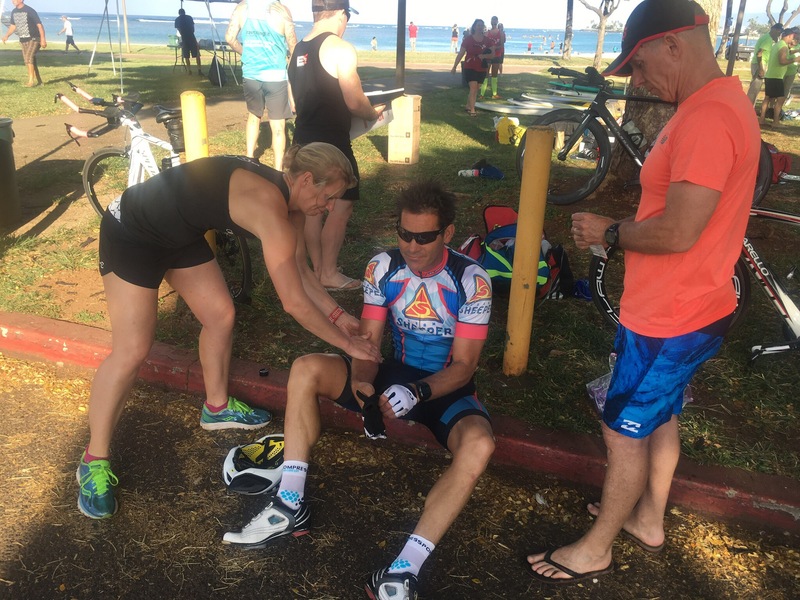 Between increasingly late starts and accumulated fatigue, that tends to lengthen the time it takes each day to finish, so you can imagine that doesn’t leave a lot of time for sleep – either for the athlete or the athlete’s crew. This was brought into its most acute state between days 4 and 5, in which Tim (and I) got a grand total of 40 minutes of sleep between his finishing the Maui stage and our leaving the condo for the airport. 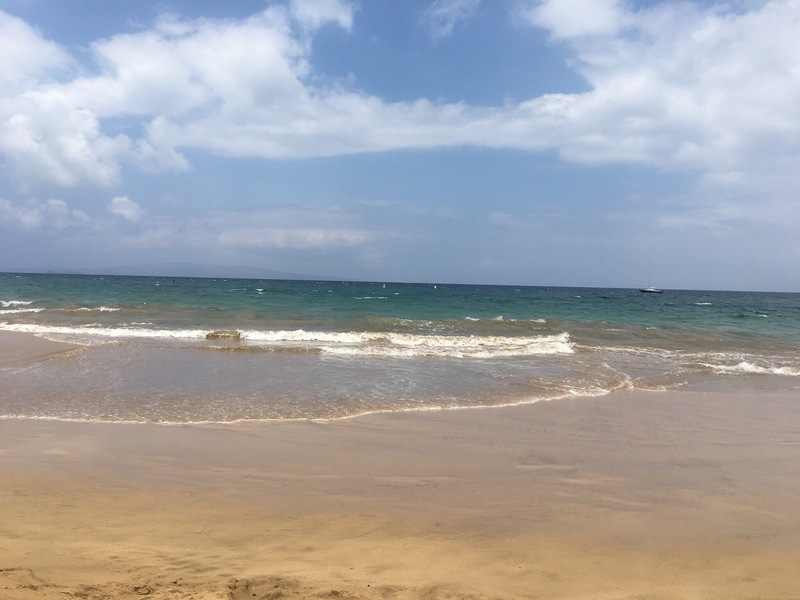 Kaua’i. We arrived here a few days early and stayed up in a nice condo in Princeville. 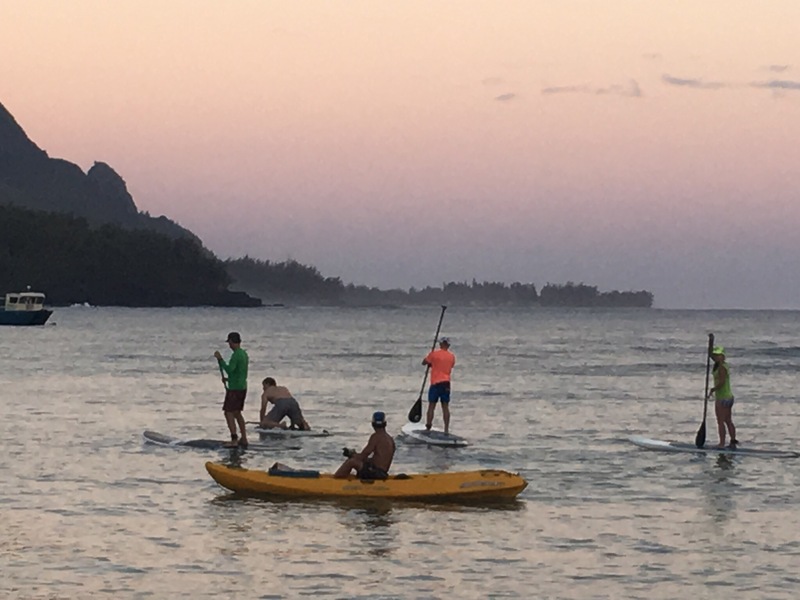 The event started down the hill in Hanalei Bay, and the water was calm, making for fast swimming conditions. Of the 10 athletes, Tim was the class of the field in terms of swimming, so he was out of the water in about 54 minutes with a pretty good lead. 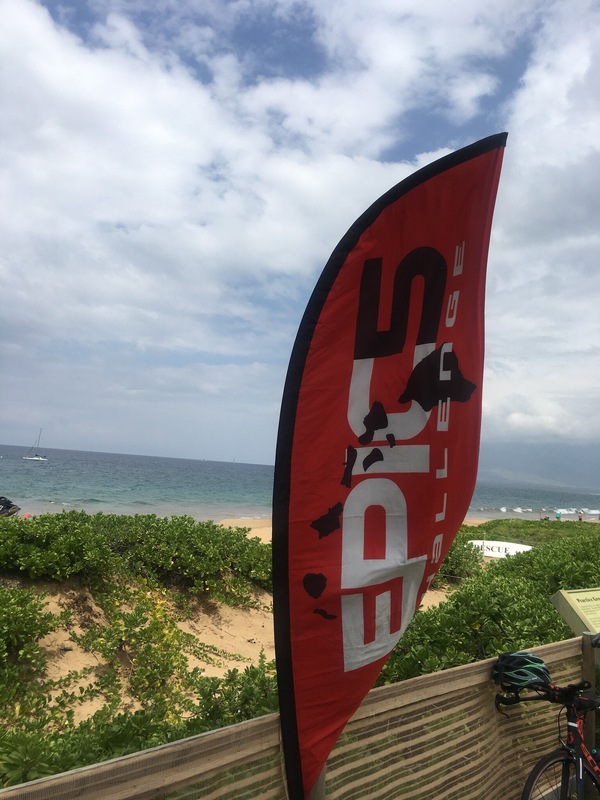 This put us out on the bike by ourselves, and we didn’t see another soul until Tim had circled the island to the turnaround point at the road to Polihale (65 miles). It was hot, and Tim was having trouble all of a sudden keeping food down (though he kept the extent of this to himself, unfortunately for his crew – this would have been good info to have had). Untimely double flats with 10 km to go made him lose 30 minutes, and the “lead” (this was an event, not a race, though some of the participants seemed to be treating it as a race). We would be plagued by flats on two more stages, and as all of them were pinch flats I’d consider riding latex tubes next time. 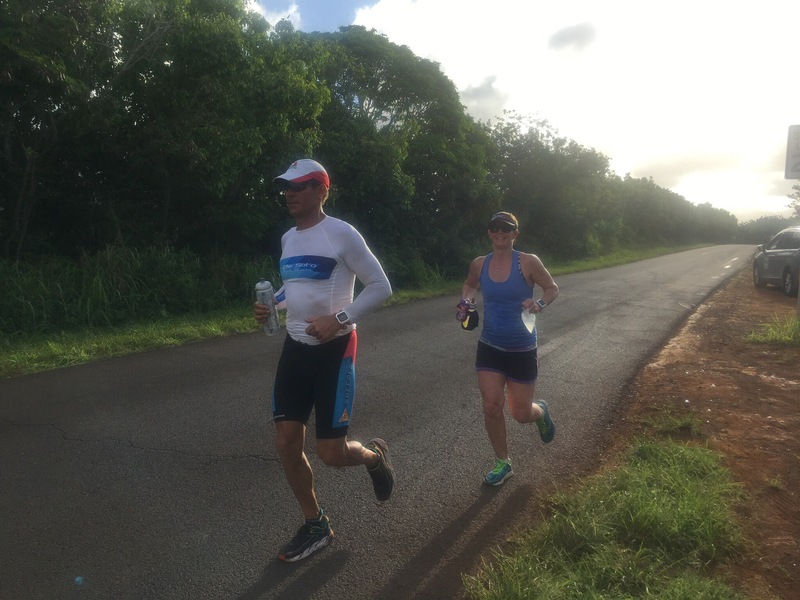 The run was on a course near the airport in Lihue in order to facilitate getting to the evening flight as quickly as possible, but it was a not particularly pleasant course to run in Friday afternoon pau hana traffic. Tim was on a plan of 25 minutes of running followed by 5 minutes of walking, then repeat. His nutritional challenges on the bike came back to haunt him, though, so he modified that pattern to a 12/3 run/walk in the second half of the run, then walked the final 2 miles in. Total time of around 12:30, including the flat and very leisurely transitions. A quick massage by Jen and we were off to the airport. Somewhat worrisome was Tim’s continued inability to eat; this didn’t bode well for the O’ahu stage. O’ahu. 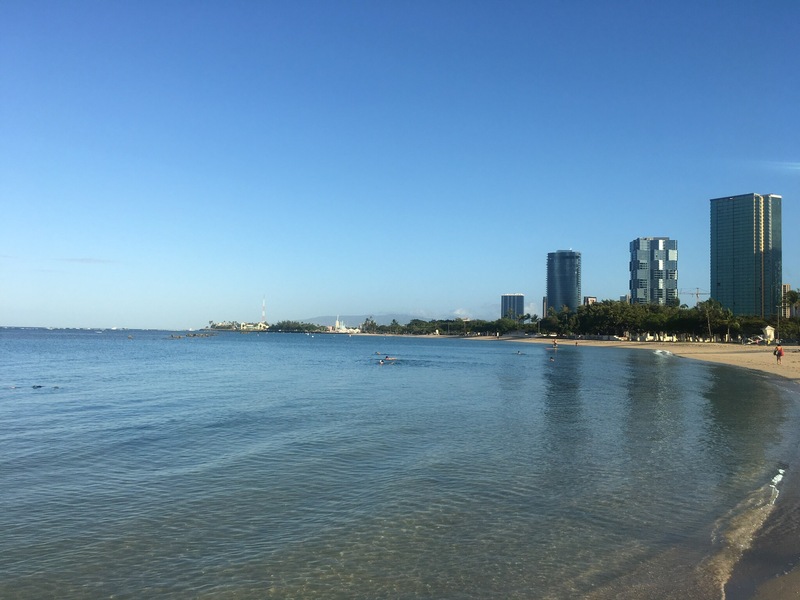 After overnighting in the Ala Moana Hotel with about 4 hours of sleep, day 2 started with a swim in Ala Moana Beach Park with two out-and-backs. 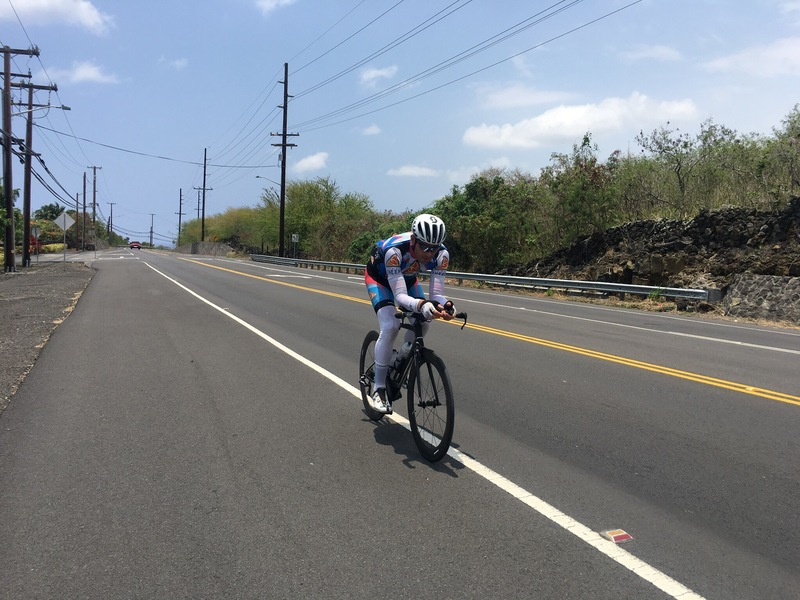 Tim went really easy in about 1:15 and took a very leisurely transition to steel himself for the logistically challenging bike, which consisted of many turns through Diamond Head and Kahala, then heading through the windward towns of Kailua and Kaneohe to the eventual turnaround in Laie. Tim had turned the flame down very low; we were characterizing this as a “recovery Ironman,” so he was riding near the back of the field. One nutritional challenge with Tim is that he is a strict vegan, so some refueling options are off limits. Luckily there was a Whole Foods in Kailua, so we were able to find some chia gels and drinks, as well as some other gel blocks and electrolyte drink mix at a local bike shop (where we also got some replacement tires and tubes for Moloka’i, where there are no bike shops). With all the traffic lights, stops, and the reduced intensity level, the ride took around 8 hours, and adding to that another leisurely transition, Tim took off on the run around 5 p.m. Given that he was walking, not running, this was going to be a long night. It was time to initiate a crew resting strategy as well, so I took the first one in order to be freshest for Moloka’i, getting about 5 hours of sleep in two separate stints. Tim ended up finishing at midnight and getting to bed at 1, and we had a 4:30 a.m. departure from the hotel. An 18-hour day and about 3 hours of sleep. This was getting ugly. 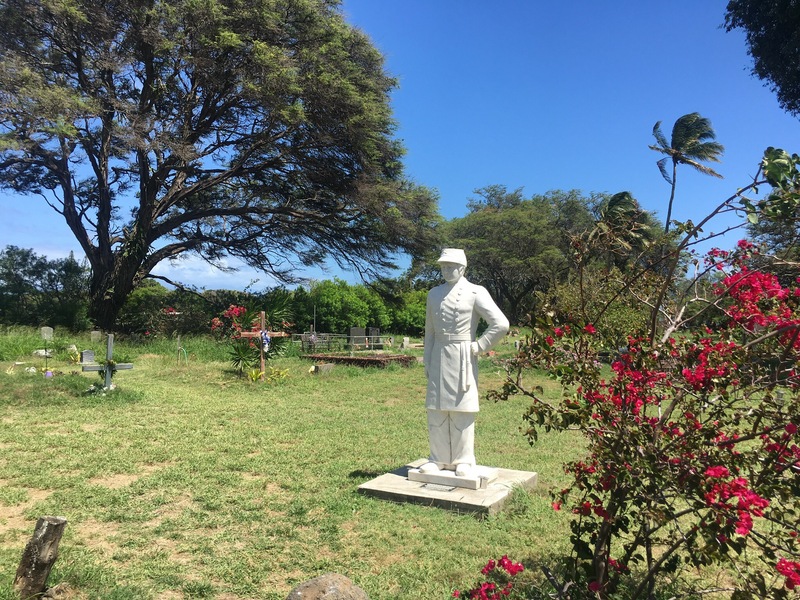 Moloka’i. 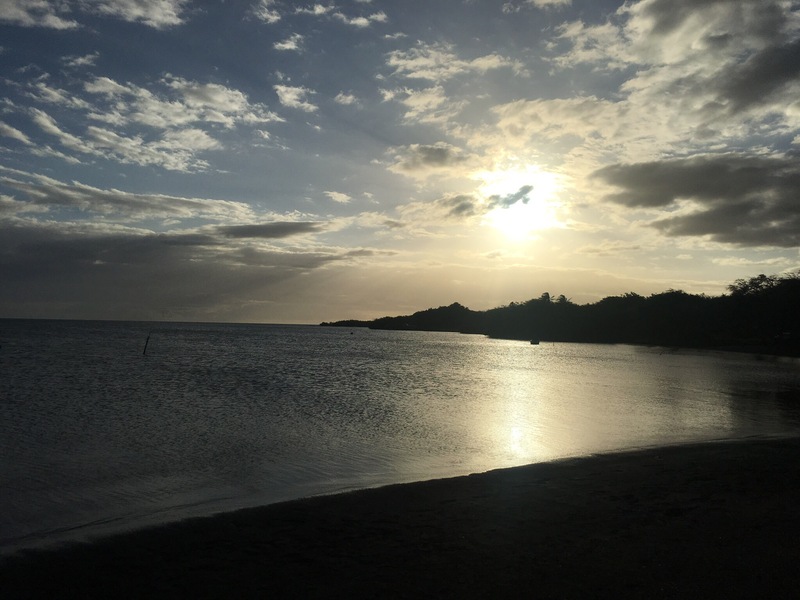 The least tourist-friendly island presented some major logistical challenges. 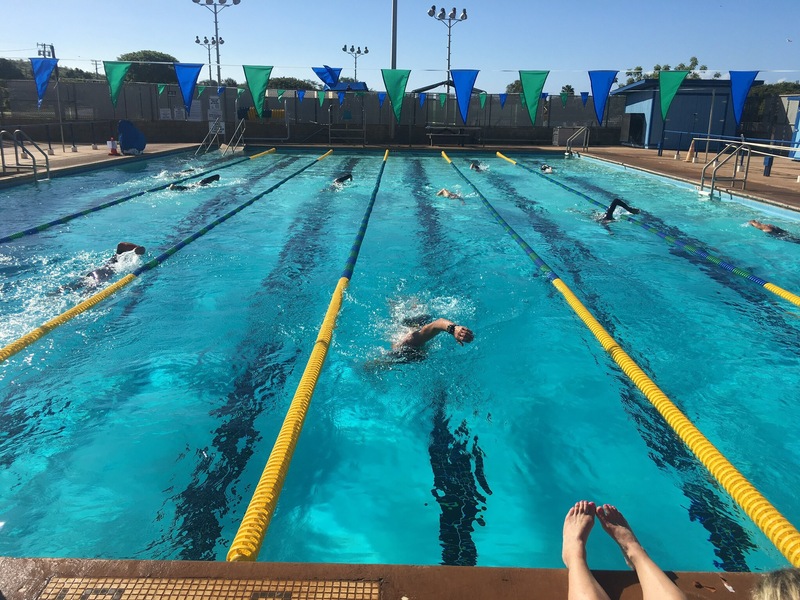 First, the typically rough ocean meant the organizers had set up a pool swim in the 6-lane, 25-meter pool in Kaunakakai, the island’s main town (you might say only town). Second, Moloka’i on a good day has very few restaurants or grocery stores, and on a Sunday you can cut that number by two-thirds. Luckily, all we really needed was water and ice, plus some food for the crew. Third, what was open was going to close early – no gas after 6 p.m., and only one restaurant open after that. 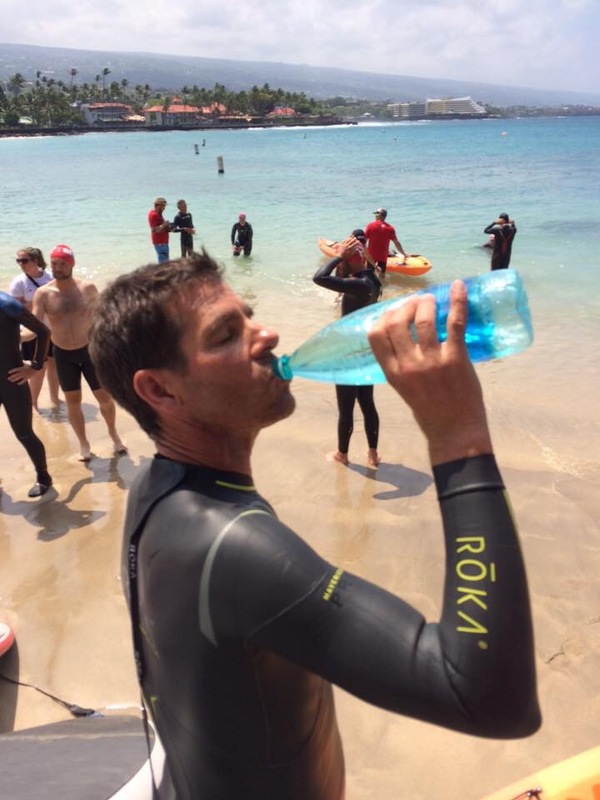 For the swim, Tim ditched his wetsuit and used Roka neoprene shorts to provide hip flotation without letting his body overheat. 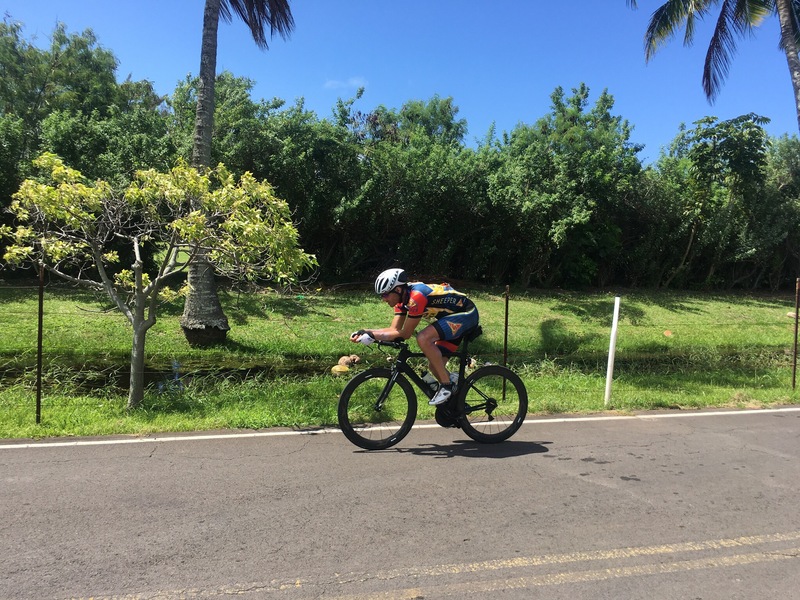 His “easy” 1:02 put him out of the water well ahead of the rest of the athletes, so once again he was soloing on the bike in front of everyone else. 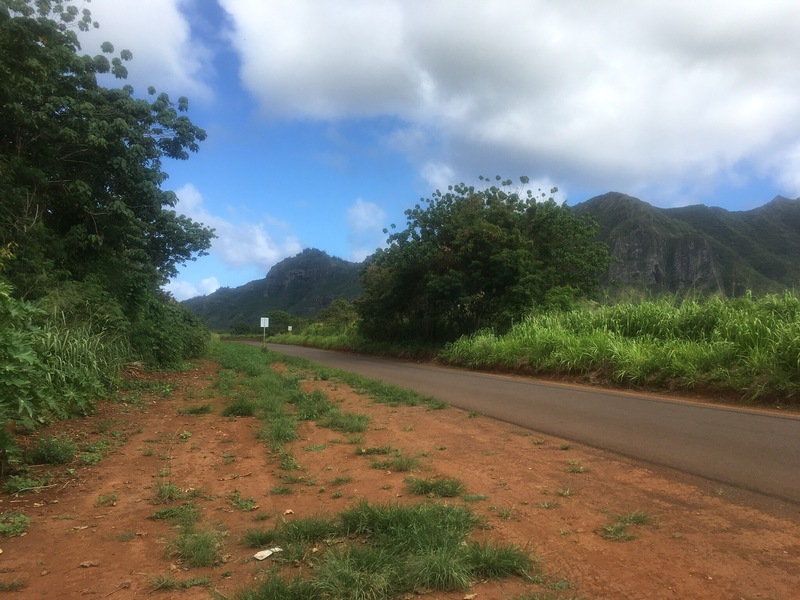 The course was spectacular, first heading east 21 miles towards the Halawa side, then turning around, coming back through town and heading up a long climb towards the ghost town of Maunaloa. 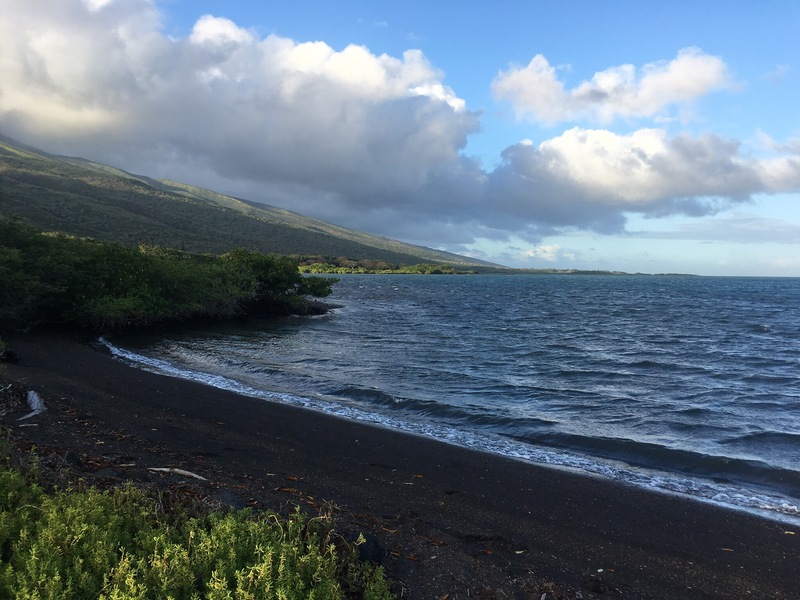 The eastbound out-and-back was then repeated to fill out the 112 miles, ending at the Hotel Moloka’i, where the run started. Tim was having a much better day than he’d had on O’ahu, so managed to run a fair amount before he started bonking, and Jen walked him in just after midnight. That made for about a 14-hour day and set us up for 4 hours of sleep before getting up to head to the chartered ferry to Maui. Maui. 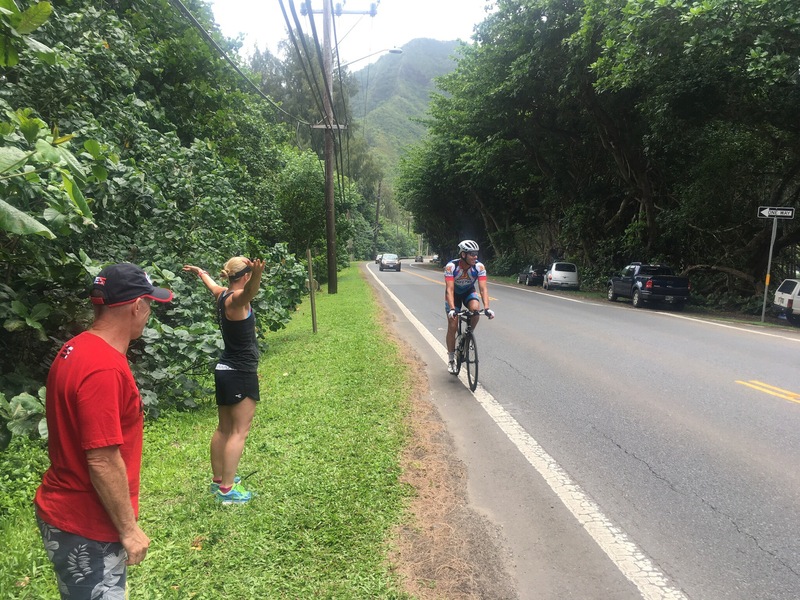 Perhpas the most logistically challenging of all of the days, Maui was tough, kind of like the third lap in a mile race. You’re not in the home stretch, but you have to push hard to maintain the same speed that you were doing more effortlessly earlier. 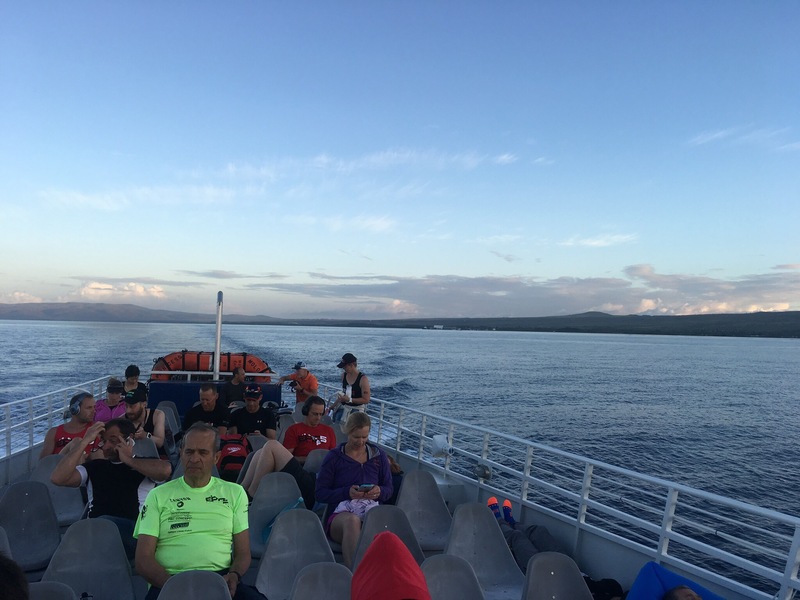 The ferry docked in Lahaina, and we boarded two sets of shuttles, with most heading directly to the swim start in Kihei and the lead drivers heading to the airport in Kahului to pick up the minivans. In this process, one of our pieces of luggage went missing, so we were down a few items (mainly replaceable supplies like washing poweder and batteries – in the grand scheme of things more annoying than devastating. As the van driver, I arrived just after the swim had started, and the ocean was looking rough! The course was 9 laps of a quarter-mile or so out-and-back, and Tim was in his element. Surprisingly, though, a bunch of the other competitors exited the water way before Tim did, and confusion ensued, since Tim had been motoring past them the entire time. It turns out that they were struggling in the conditions and, seeing 2.4 miles on their Garmin watches, decided to exit after only 6 laps. WTF?? I won’t go into the technicalities of why you don’t trust wrist-based GPS in a relatively short swim course (e.g., you don’t use GPS mode in a pool), but this was blatant course-cutting on the part of those guys. This put Tim, who swam 1:30 under those tough conditions, in a 40-minute hole relative to the cutters vs having a 40-minute advantage. Again, this wasn’t a race, and Tim was mellow about it though disappointed that his strength as a swimmer had been negated, and we (his crew) were livid. I would guess only 4 of the 10 swam the full course, and I’m not even sure of that. Anyway, Tim was finally off on the bike around 1 p.m., which headed first down through Wailea and Makena to La Perouse, then headed north to Kahului before circling part of West Maui through the pali, the town of Lahaina and the resort areas of Ka’anapali and Kapalua before reversing course and ending back at the beach in Kihei. I had gotten a couple of hours of sleep while Tim was out on the bike, done our laundry and gotten some food for the crew (and a veggie burrito for Tim to help him get calories). Tim got back around 8:30 p.m. and started the run around 9. 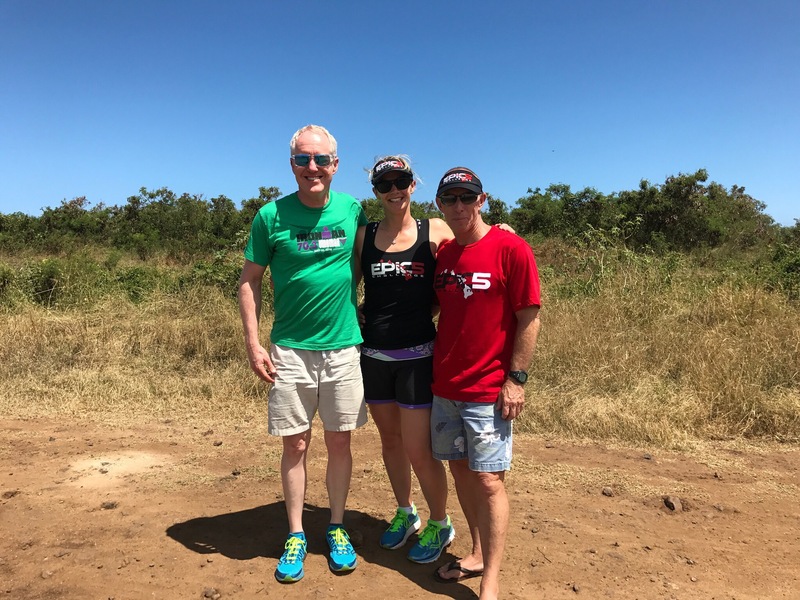 He was severely depleted, so this was going to be a walk rather than a run – another “recovery Ironman.” I sent Mike and Jen back to the condo to get some sleep, so it was just me in the support van for the long night. The veggie burriot wasn’t sitting well, so we got some Rolaids in him (thank goodness for the Epic 5 staff members who had some extra supplies and came to meet us with them). Tim was essentially going about 20-minute miles, so we were looking at an 8-hour run. 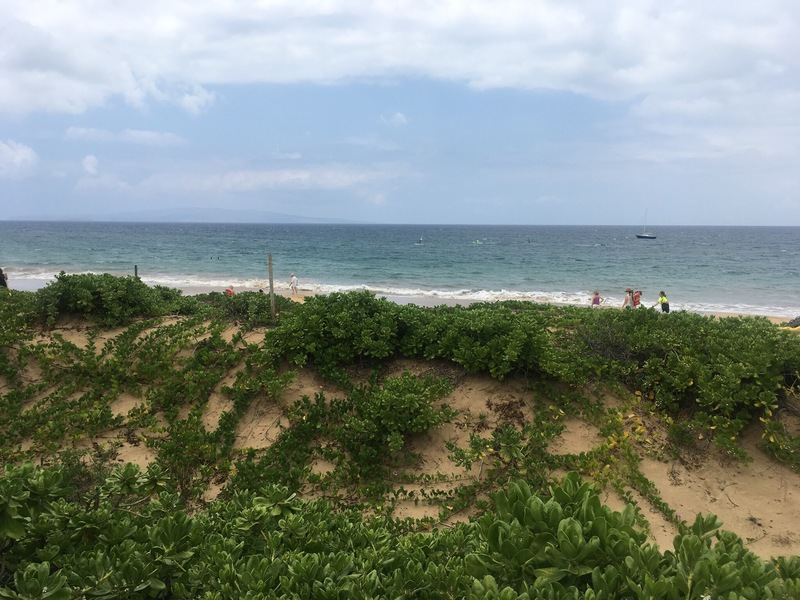 Normally-busy Wailea and Kihei were eerily quiet in the wee hours of the morning, other than one drunken couple stumbling along the sidewalk in Wailea who became quite animated when Tim passed them…animated, if not exactly coherent. 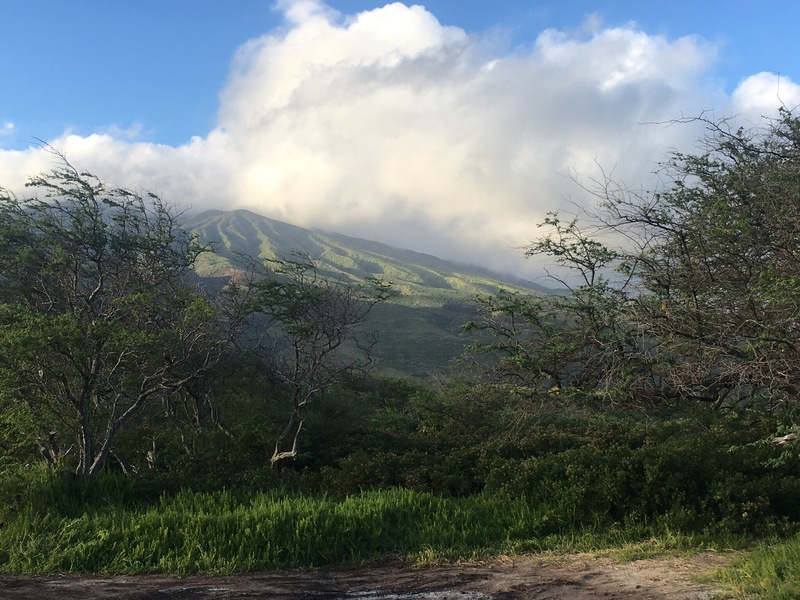 At the suggestion of staff member Mary Margaret, whose husband is an experienced ultrarunner, I headed to Kihei’s 24-hour Safeway once we were back from the southern out-and-back 16 miles and bought some chocolate Ensure, which provided essentially a 350-calorie meal in a can. That worked very well when cut with some water; the other thing we tried was chicken broth, with worked horribly at room temperature, and even once I threw some in the microwave Tim couldn’t tolerate it. The Ensure did work its magic, though, and Tim started to come around. I turned over shephering duties in the final mile to Jen and Mike, who had been able to get a few hours of sleep, and headed home for a quick 40-minute nap while Tim finished and Mike and Jen organized the van and packed up. As bad as I felt when I was rousted out of a sound sleep, I knew Tim must have felt way worse – he looked like a zombie. That’s what another 18 hours of an Ironman + 40 minutes of sleep will do to you. 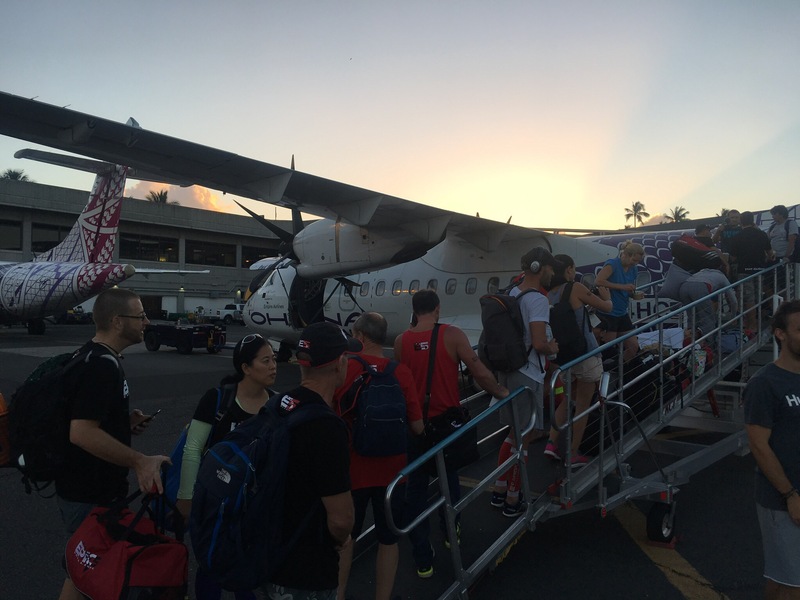 Kona: we got to Kahului airport in time to make the charter flight to Kona, and again (as with the flight from O’ahu to Moloka’i), we had to decide which few pieces of luggage we could leave behind to come in on a later flight. We left the spare wheel case (which we never needed – lesson learned for the future) and the massage table, and they dutifully showed up mid afternoon. 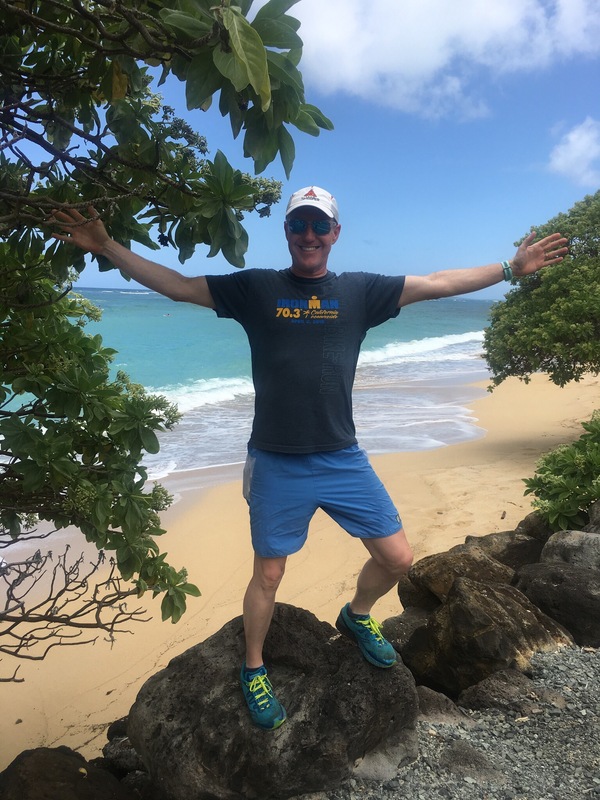 The Kona course was the same as the Ironman World Championship course, except for the run, which due to road construction on the Queen K was turned into a double out-and-back along Ali’i Drive down to Keauhou (which added a cruel series of short steep hills). The ocean was rough, and with all the inevitable delays the swim started around 11 a.m. Tim seemed pretty chipper for someone operating on such enormous fatigue – probably some combination of the better nutrition kicking in and the knowledge that this was the last one and was on a course he knew very well. The conditions were rough enough that the paddlers were having problems, but Tim knocked out a “relaxed” 1:06, about 30 minutes clear of anyone else. We took our time getting him ready for the bike, now using white arm and leg cooling sleeves to avoid further sun damage, which he’d incurred in the previous days despite frequent applications of sunscreen. 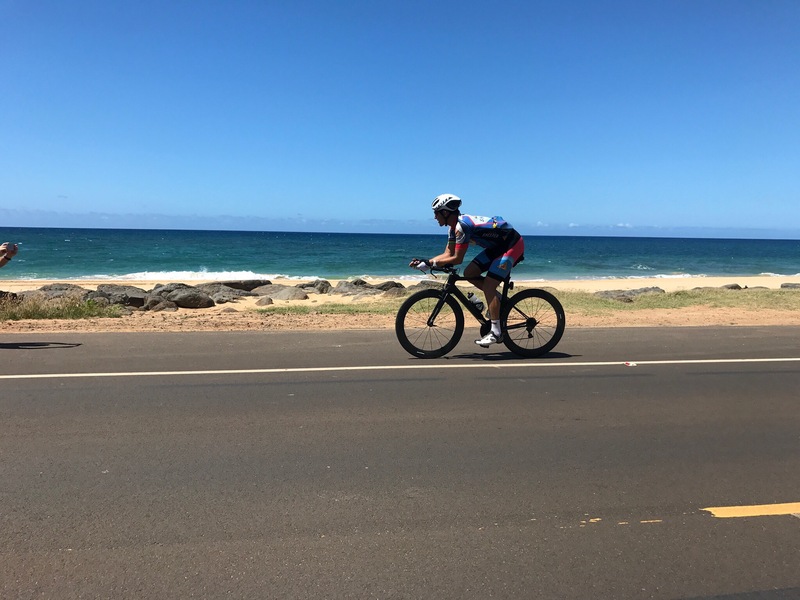 It was hot and windy for the initial portion of the ride, and the winds were really ripping on the road between Kawaihae and Hawi – fortunately, Tim’s a confident bike handler. The question mark for today was going to be the run: how much of a toll had the previous four days taken, and was it going to be a run or a walk? It turned out to be a run! The best news about that was that neither he nor his crew were going to be up all night. 🙂 This ended up being his second-fastest day (after Kaua’i), so he really ended on a positive note. 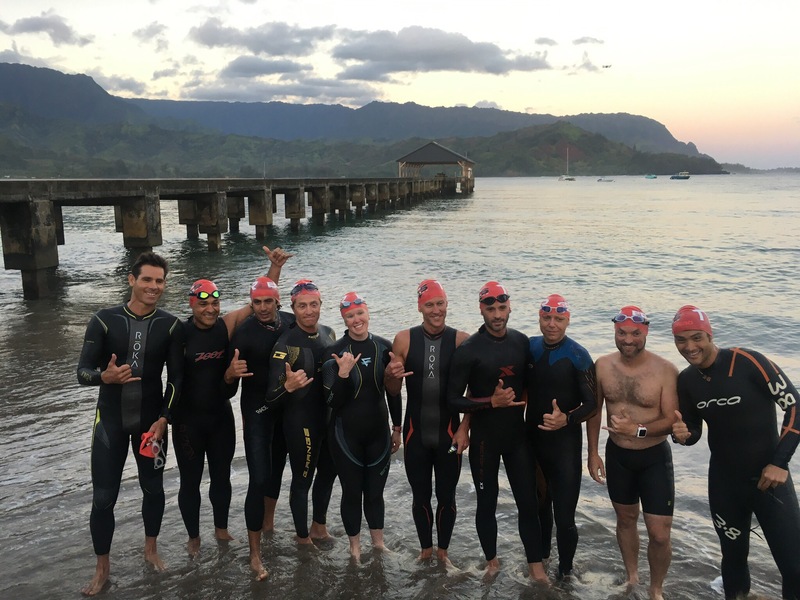 10 athletes started, and 10 athletes finished, which was a first in terms of both sheer numbers and of a 100% finisher rate (we’ll ignore the Maui swim for record purposes 🙂 ). Overall, it was a great experience, and we made so many new friends among the other athletes and crew – joint suffering will do that. I can promise my wife Jeanne, though, that I have little to no interest in actually doing this one myself. You need Rita to keep those miscreants under control in Kihei! Beyond epic. I can’t even imagine being his crew, let alone Tim. Beyond words.